EU leaders gathered in Brussels on Wednesday for an emergency summit to discuss UK Prime Minister Theresa May’s request for a second Brexit delay until June 30. 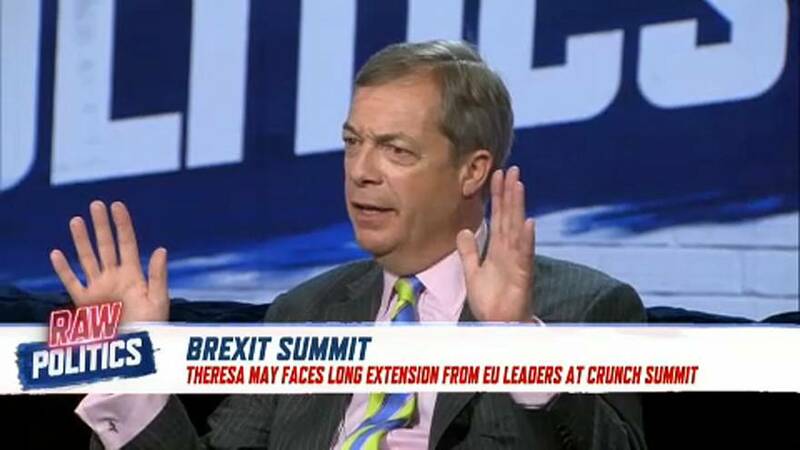 On Wednesday night’s episode of Raw Politics, former UKIP leader Nigel Farage conceded that despite finding the idea of an extension “appalling”, it may be the UK’s best option. “As a eurosceptic, as a Leaver, I’d much rather now have an extension than accept the treaty that Mr Barnier gave to Mrs May,” Farage said. Euronews political editor Darren McCaffrey — who was reporting from the summit — said that EU leaders were primarily interested in a longer deadline that will include strict restrictions. “They cover everything from essentially Britain not being able to take part in this election of the EU Commission president, not having a veto on the future budget decisions, or indeed that the EU 27 could meet amongst themselves informally to talk about the future business of the EU,” McCaffrey said. Swedish MEP Anna Maria Corazza Bildt suggested that these requirements could help ensure Brexit negotiations do not continue to disrupt citizens and businesses within the EU.